The last few weeks have been extremely busy for me here at the farm. About the time the growing starts to end of the farming and business education begins. In the past 2 weeks I have attended several conferences and classes. Every Monday for the past month I have been attending an agriculture business record keeping class. This class doesn’t end until mid-December. On the 4th of October I went to Oklahoma City to attend the Produce Safety Alliance course that covered the new Food Safety Modernization Act set forth by the FDA. Even though we are still small enough that we are not required to meet the new FDA standards we are diligently working on meeting the standards. 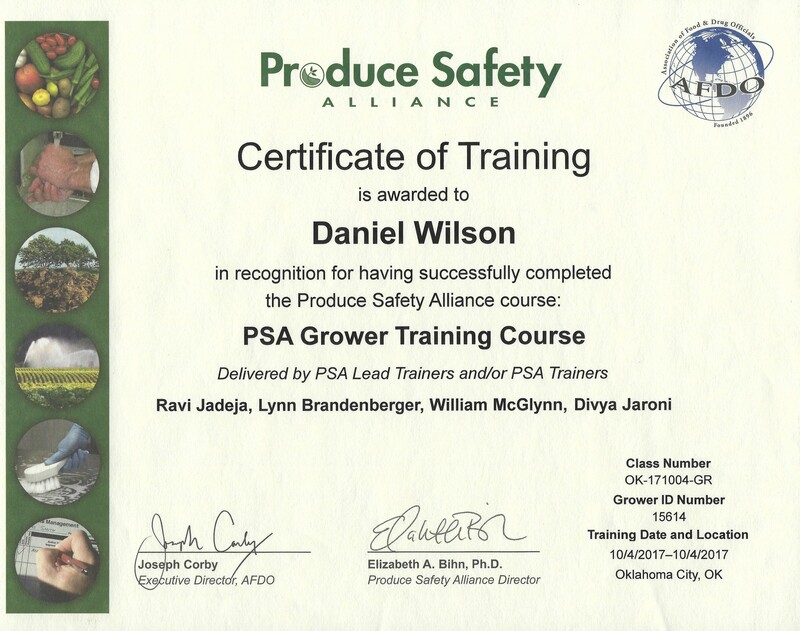 Taking this class gives me the ability to make sure that everyone that works for me is trained in produce safety and the new SOPs we will implement will ensure that everyone is following the proper produce safety guidelines. In this way we are putting our consumers safety and health in the forefront of our farming operation.